As it does with every new Apple product, iSuppli has taken the mystery out of how much money Apple is making on each new iPad. Though total costs are, on average, 9% higher than the iPad 2, with most of the increase going into the Retina Display, Apple still has nearly a 50% margin on each device when you factor in materials and manufacturing costs. 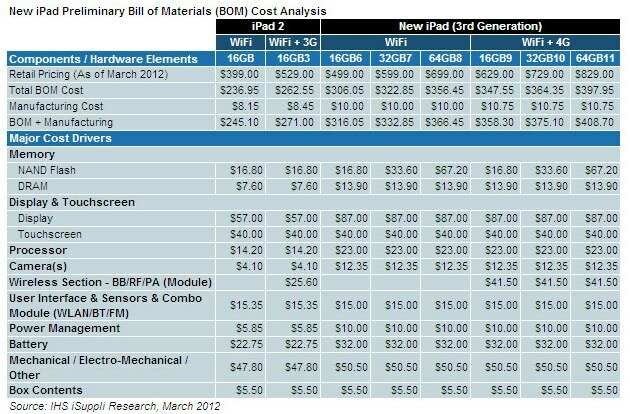 A 16GB WiFi iPad costs $316.05 USD to manufacture, and it sells for $499 in America and $519 in Canada. More expensive models like the 64GB LTE model costs $408.70 to manufacture, but sell for $829/$849, a margin of over 50%. Apple’s profits increase the more NAND memory is in the device, since it’s a marginal cost increase for them between 16/32/64GB chips, but they sell each model for $100 more than the last. Samsung also seems to be a big winner here, providing nearly 40% of the internal components in the new iPad. Already confirmed are the LCD screen (though Sharp and LG are confirmed as future suppliers), the A5X processor and perhaps the NAND memory, though Toshiba and Hynix are sourced as well. iSuppli also suspects that Samsung is the supplier of the new iPad’s capacious 42Whr battery which, if true, would put them at roughly 50% of all the internal components. And who says competition is bad for business? Read the whole breakdown over at iSuppli.